Former Brazil star Sissi, one of the 13 women featured in Chelsea Clinton’s upcoming book, “She Persisted Around the World: 13 Women Who Changed History,” coaches girls soccer and is Technical Director at Walnut Creek SC, located 20 miles east of San Francisco. Brazil’s No. 10 before being succeeded by Marta, Sissi was the Silver Ball MVP winner and Golden Boot leading scorer at the 1999 World Cup, where she helped Brazil to a third-place finish. She also played in the 1995 World Cup and in two Olympic tournaments. Sissi’s pro career included stints with the WUSA’s San Jose CyberRays, WPSL’s California Storm and she was player/assistant coach of the WPS’s Gold Pride before retiring and settling in Northern California, where she also serves as assistant coach of Solano College women’s team. SOCCER AMERICA: Can you tell us about being featured in the new book by Chelsea Clinton? SISSI: I remember when I received the email. I had to pinch myself. I never would have dreamed this would happen to me. And to be honest ... I cried. I look at myself everyday in the mirror, and I just see me. I was so humbled, yet honored, that someone like Mrs. Chelsea Clinton chose me as an inspiration for this book. I hope her readers will be inspired by her choice! Tell us a little bit about how and why you started playing soccer? I started playing soccer at age 7 and fell in love with the game immediately. I used to watch my dad and brother play in the backyard, but girls didn't play soccer. I wanted to play! So I improvised. I used to rip the heads off from my dolls and kick them around the house, the street, the backyard. Another trick was stuffing an old sock with newspaper or toilet paper. Then one day my father got me my own ball ... that's when my life really changed! That was the best gift ever! Here I was -- a girl with her own soccer ball -- playing soccer. As a girl, you played a lot with boys, right? Do you encourage girls you coach now also to play with and against boys? I did play with boys. I had too! There was really no other choice. They didn't treat me any differently, and Lord knows I was not afraid to play with them! People would talk about how I was not supposed to play with them, but I didn't listen. I knew what I wanted to do. I was not going to let anyone change who I was or alter my dreams. I wanted to play professional soccer and represent my country. I will encourage my players to play with the boys. Sometimes at practice we will scrimmage together. You can definitely see the fire in their eyes when they play the boys! So fun to watch! 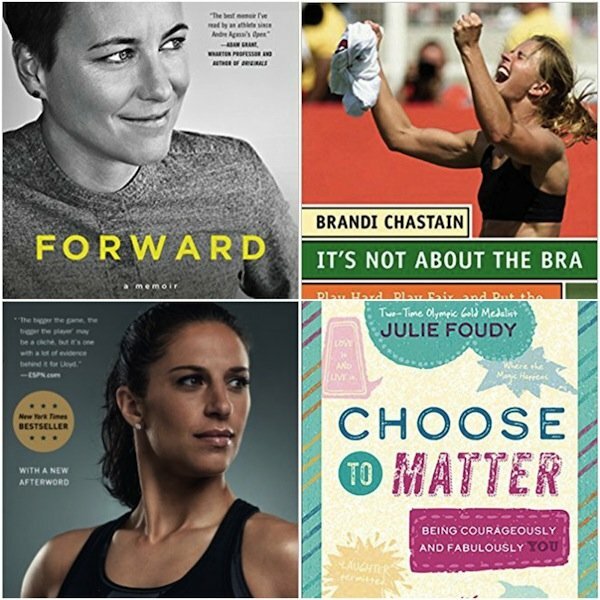 "Forward: A Memoir" by Abby Wambach; "It's Not About the Bra: Play Hard, Play Fair, and Put the Fun Back Into Competitive" by Brandi Chastain; "When Nobody Was Watching: My Hard-Fought Journey to the Top of the Soccer World" by Carli Lloyd; "Choose to Matter: Being Courageously and Fabulously YOU" by Julie Foudy. What do you like most about coaching? I love soccer. It is my life. But I understand that soccer is just a part of their life right now. My goal is to develop the players and teach them life lessons. We win, we lose. There is always something to learn. I try to focus on their work ethic and discipline. They must grow as individuals, but work together as a team. Respect their parents, their opponents, the coaches, the referees and each other. Coaching soccer has turned into my next passion! Very rewarding and fulfilling. Anything you don't like about coaching? Sometimes parents can do difficult things. Not all the parents, but some of them. That is the reason why I like coaching the "little ones." The younger age groups are so fun and the expectations from the parents of their own children are very minimal. When you coach the older kids, you have to deal with so much more. I did it for many years, but now I find comfort and solitude in teaching the young girls [U-11] the purity of the beautiful game. We have a different kind of pressure ... a more relaxed kind. "Pelé: Birth of a Legend" (2016); "Her Best Move" (2007), "Bend it like Beckham" (2002). What are the biggest differences between girls soccer in the USA compared to Brazil? It’s a night and day difference between the U.S. and Brazil. Especially for the women. There is so much support, acceptance, structure, facilities and opportunities here -- the children are very fortunate. There is a lot of talent in Brazil too, but lack they all the items I just mentioned. I hope and dream that someday my country can accept the women's program like they have done here in the U.S.
What do you think can be improved in American youth soccer? I would focus more on the development part of soccer and put less emphasis on winning. If you truly develop a player -- all the players -- winning will come naturally. To be patient. Allow the players to be creative and make mistakes ... they will learn. Be energetic and passionate. Be a role model. Treat all players the same. Have your children work hard -- on and off the field. Be committed, dedicated, disciplined and passionate. Encourage the kids to do the same. Most importantly, keep it fun! Advice for young players who want to play college or professional soccer? Always follow your dream. Work hard. Put in the extra work on your own. 4 comments about "Brazil star Sissi on coaching American girls, appearing in Chelsea Clinton's new book, and what's impressive about U.S. youth soccer". frank schoon, December 7, 2017 at 10:59 a.m.
Good interview, I wish MIke in these interviews would go a little deeper and spend more time in asking questions dealing with the aspect of the development of the player, him or herself, when they were young and what he/she did to improve as well. These types of questions would give youth coaches additional ideas in developing their kids. Have you noticed the recurring theme in the last several interviews is "street soccer ,pickup games" where kids learn the game playing with MIXED AGES, BETTER PLAYERS, and now in ,this case, like Michelle Akers, MIXED GENDER....But it can all be summed up, MIXED AGES, means PLAYING WITH BETTER PLAYERS. PERIOD!! This is a GOLD NUGGET , now I hope that the USSF and local soccer association would begin to employ this GOLD NUGGET in developing their youth. It is not about getting licensed coaches in developing kids but getting kids to play MIXED AGES. I mean, how times do you have to be hit on the head reading these interviews that it is about PICKUP/STREET SOCCER and MIXED AGES. What is so ironic is that the USSF and these local soccer association stress licensed coaches to develop youth, when in fact it hurts the development of the youth. The problem is that most of these coaches once they acquire a licensed become and act like the BARNEY FIFE OF SOCCER instead of Mayberry. frank schoon, December 7, 2017 at 11:02 a.m.
Now here comes a girl SISSY, whose learned under an Environment which gave NO Support, NO Acceptance , NO Facilities, and NO Structure, but played basically Pickup games with better players, Boys...JUST AMAZING.. She comes to play in America and becomes a revelation to the American fan and American soccer players who had the BENEFIT of having played and learned under a GREAT ENVIRONMENT, SUPPORT, OPPORTUNITIES, FACILITIES, all of which Sissy never had!!! This should tell you something about how IMPORTANT it is to play “street soccer, pickup ,mixed ages” for one’s development. Sissy’s one comment about American Soccer is to improve American PLAYER DEVELOPMENT. R2 Dad, December 7, 2017 at 8:30 p.m. Even a legend like Sissi has to deal with whining parents and chooses U11 kids to avoid obnoxious grown-ups. That should tell you all you need to know about the state of parenting in our soccer environment. frank schoon replied, December 8, 2017 at 11:37 a.m.